Essex’s largely undiscovered football sleeping giant is ready to awaken and take this season’s Vanarama Conference South by storm to progress to the top tier of the Non-League game before we reach our ultimate goal of a place in the Football League and putting our City on the map! The Clarets are based at Melbourne Community Stadium, Salerno Way, Chelmsford, Essex, CM1 2EH. Why not bring the whole family along for the same price as a single Premier League ticket? Home matches take place on Saturdays at 3:00pm and Monday nights at 7:45pm (cup games 7:30pm) and the community environment at the club continues to grow each season, with four-figure crowds regularly getting behind the lads. Your club needs you! Chelmsford City are devoted to serving the community in the same way they support every side from the Under 7's to the First Team. For details on the next match click here, social event click here or to enquire call the office on 01245 290959 or email enquiries@chelmsfordcityfc.com. 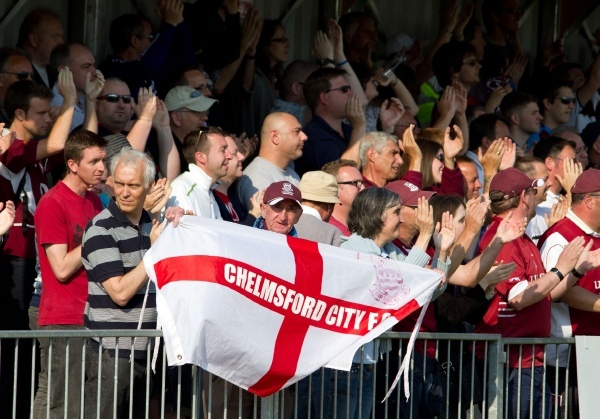 Company Name: The Supporters of Chelmsford City Football Club Ltd. Company Number: 02957198. Jointly Owned by All Company Members.